I have taken two of my all-time favorite dishes and combined them to make the most EPIC soup of all time! Jalapeño Popper Loaded Potato Soup. If you love Jalapeño Poppers and Loaded Potato Soup as much as I do, I think this soup is really going to knock your socks off! This decadent soup is so amazing I can’t even begin to describe it. There is just so much going on here. It’s rich and creamy with a nice kick of spice, but not so spicy that it punches you in the face with heat. The cream cheese really mellows out the spiciness. With all the different flavors and textures every spoonful is just a little bit different. I have included some ideas for garnishing the soup. I think that crunchy corn chips would add a great texture. Also, if you find this soup too spicy, a dollop of sour cream will really soften the spiciness. Remove the seeds and ribs for less heat. I chose to remove them as the Jalapeños that we have been buying have been extremely spicy. You could also use fewer jalapeños for less heat. If you like really spicy foods, use extra jalapeños. You could also add hot sauce. Make sure the cream cheese is room temperature so that it melts into the soup. In a large heavy-bottomed pot, cook bacon over medium heat until crispy. With a slotted spoon remove bacon to a paper towel-lined bowl. Leave about 2 Tablespoons of rendered bacon drippings in the pot. Saute onion, red pepper, and jalapeño peppers about 5 minutes or until softened. Add garlic and cook for another minute. Sprinkle flour over vegetables. Cook for 2 minutes, while stirring. ( The roux should be the consistency of wet sand if it seems too dry add another Tablespoon of bacon drippings or butter to the pot). Whisk in chicken stock and milk, stirring well to ensure there aren’t any lumps. Add potatoes to pot. Bring to a gentle boil. Give it a good stir. Cover and reduce heat to low. Stir once or twice during the cooking process. Cook until potatoes are tender, about 20 minutes. 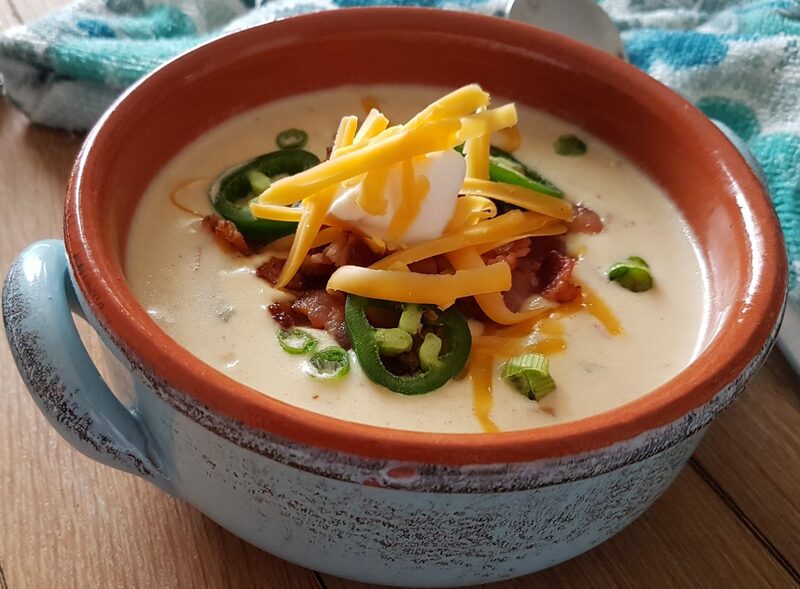 This entry was posted in Main Dish, One Pot Meals, Quick and Easy, Soups and Stews and tagged Bacon, Cheese, Jalapeno Popper Soup, Loaded Potato Soup, Quick and Easy Recipes, Spicy. Bookmark the permalink. Perfect meal on a cold winters day! love jalepeno everything! this sounds good thanks for the share!